There are several Christmas markets in Budapest, with the main ones concentrated in the city center in Pest. A real tradition of the capital, the Christmas market in Budapest is a must for Christmas Eve, creating a magical atmosphere by enhancing the architecture of the Hungarian capital. 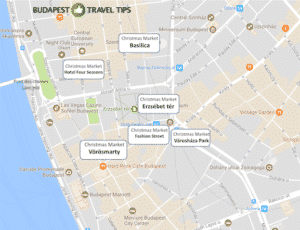 We have selected 6 Christmas markets in Budapest for you. Here they are! They are located less than a 10-minute walk from each other! 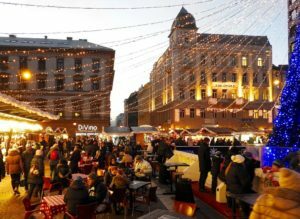 The biggest Christmas market in Budapest is located on Vörösmarty Square in the heart of the city at the end of the Váci pedestrian street and opposite the famous and historic Gerbeaud café. More than 100 wooden lodges of local craftsmen await you. In the center of the market on 1200m2 are culinary booths that offer a taste of Hungarian specialties. 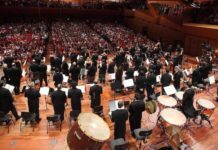 Animations, concerts and activities for children are organized every day on the main stage (weekdays from 17:00 to 20:00, weekends from 10:00 to 12:30 and 16:00 to 20:00). This Christmas market in Budapest has been ranked by the British magazine, Time Out, as among the 5 most beautiful Christmas markets in Europe! 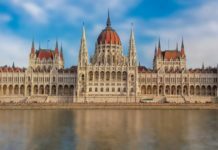 Address: Vörösmarty tér, 5th district, Pest – Budapest. 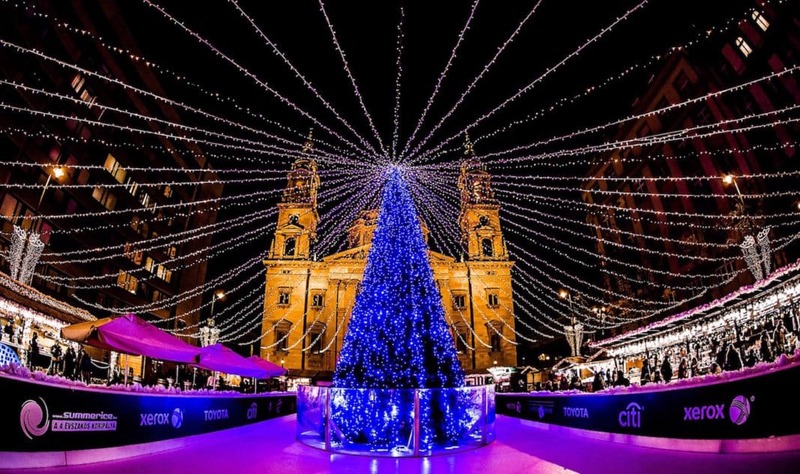 Located less than a 10-minute walk from the Christmas Market on Vörösmarty Square, the St Stephen’s Basilica Christmas Market is a must-see with artisan and gourmet stalls, an ice rink at its center and, above all, a unique experience every day with the projection of different animated films on the facade of St Stephen basilica. These magical projections take place every 30 minutes between 16:30 and 22:00. 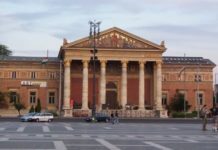 Address: Szent István tér, 5th district, Pest – Budapest. Official website of this Christmas market of St Stephen’s Basilica (‘Adventi unnep’) on this link. Good Tip: 50m from the Basilica at number 5 on ’Hercegprímás’ street (street perpendicular to the right when you face the basilica), you will discover the majestic view of the neighborhood and basilica from the High Sky Note, the terrace on the roof of the hotel ARIA (full information found in our article, ‘The Rooftops of Budapest’). 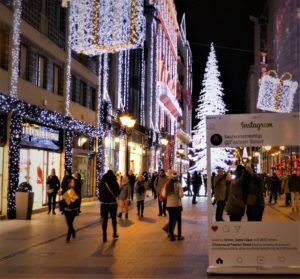 After visiting the Christmas market on Vörösmarty Square, just 100m away you will find Deák Ferenc Street, called ‘Fashion Street’. Indeed, this shopping street about 500m long welcomes Christmas crafts and gastronomic stands; above all, it will dazzle you with its impressive and bright Christmas decorations. 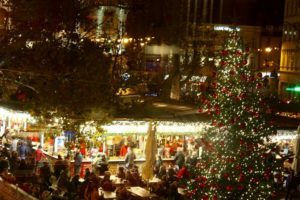 In a small park of the Town Hall, you will find a charming little Christmas market with many activities for children and the largest Christmas tree in the capital. The Christmas market at Erzsébet Square focuses on Christmas specialties that can be enjoyed on the spot or as gifts. 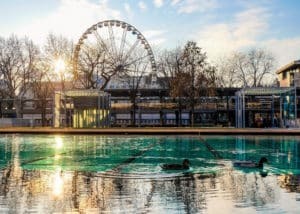 It is located at the foot of the Ferris Wheel and is open daily from 10:00 to 23:00. (See the official site of the Budapest Big Wheel on this link). Ticket price of the Ferris Wheel: adult 9 €, child 5 €. Located inside the Four Seasons Hotel (Gresham Palace), this Christmas market affords the opportunity to discover the unique Art Deco interior architecture of this palace, ranked among the most beautiful hotels in the world. Its Christmas market is distinguished by luxury goods exhibitors (gastronomy, porcelain, jewelry, perfumes, etc.). The Four Seasons Budapest Christmas Market is open from 24th November until December 24th. 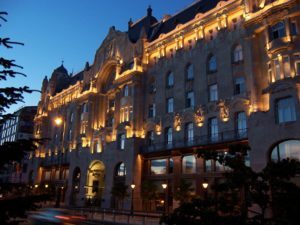 Address: Four Seasons Hotel Gresham Palace, Széchenyi István tér 5, 5th district – Pest – map. 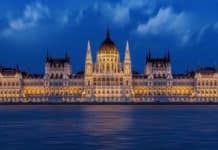 Also discover the culinary specialties to be enjoyed at the Christmas markets mentioned in our article, ‘What to eat and drink at the Christmas markets of Budapest?‘ on this link as well as ‘the concerts and shows’ in Budapest on this link!